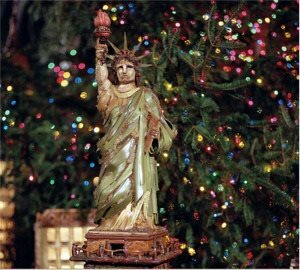 NYC Holidays such as Thanksgiving and Christmas are delightful! This page is dedicated to NYC Holiday Thanksgiving Christmas 2009. There is NOTHING on the planet like New York City at holiday time. The trees, lights, store window displays, ice skating, white snow, the smell of roasted chestnuts (which, by the way, smell far better than they taste). During the NYC Holiday season, the City is breathtaking. It’s also pretty cold and more crowded than usual, ahhh but that is the price we pay. Do YOU have a favorite NYC Holiday Memory? Share Your Favorite NYC Holiday Thanksgiving Christmas memory and create your own page on the NYC Insider Guide! Send us your story and favorite photo. 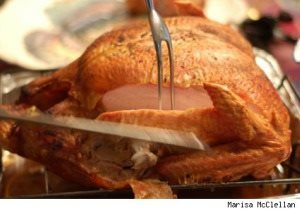 Tell us where you ate on Thanksgiving or Christmas. This video on You Tube does a wonderful job capturing the essence of New York City during the holiday season. Thomas Kinkade discusses the creation of his painting, “Christmas in New York,” but the video quality and his narration of New York City during the holidays is delightful. He discusses the horn-blowing Angels that lead us to the Rockefeller Tree, Prometheus and the ice skating rink. The Angels represent hope and Prometheus, the gold statue in Rockefeller Plaza, represents the legend of the ancient Greek Titan, bringing fire to mankind. Cautionary Note: During NYC Holidays, such as Thanksgiving and Christmas 2009, most restaurants will offer a special pre-fixe holiday menu. Remember, these are days when the restaurants know mostly NYC Visitors, and not their repeat customers, are dining. They know they have a captive audience and price accordingly. If your Thanksgiving Dinner at home is truly special and wonderful, then don’t try and replace it. Do something different – and something very NYC! Eat in Little Italy or Chinatown, for example. Go to Greenwich Village, SoHo, West Village or Union Square. After all, this is where NYers live, so if they are eating out, these restaurants are catering to their local regulars. Get away from the crowds and the other tourists and have a slice of NYC all to yourself. New Parade Route for 2009. 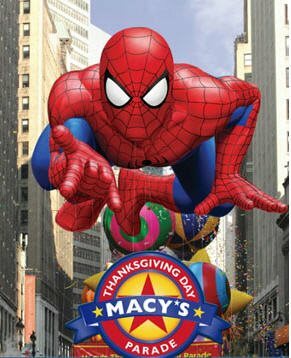 The parade will be moving from Broadway to a new route along 7th Avenue this year, allowing better spectator viewing. The Parade starts at 9am, so for best viewing get there no later than 7am. The starting point is on Central Park West and 77th Street, however, it is not advisable to watch the parade on CPW or Columbus Circle. Move further down to 7th Avenue. There are high winds and lots of shade along CPW, so the floats and entertainers have been known to “rush” through this area. Pick a sunny spot down on 7th Avenue between Times Square and Macy’s on 34th Street. Balloon Set Up. This is actually as much fun as the Parade itself and many of us have stood outside with Hot Chocolate (or, um, something stronger) and watched the Parade being set up. The set takes place on either side of the American Museum of Natural History, on 77th and 81st Streets between CPW and Columbus from 3-10pm on Wednesday, November 25th. December 2nd, 2009 (usually the first Wednesday in December). 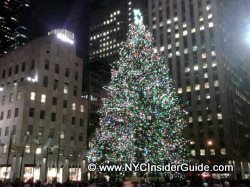 The Rockefeller Center Christmas Tree usually arrives in November, the lighting ceremony is usually the first Wednesday of December (the week after Thanksgiving) and the tree stays up through the first week of January. This is a dazzling and detailed replica of Manhattan, made entirely from natural plants, and 14 electric trains running in loops around the city. Just like NYC, twinkling lights go on at night with both city and holiday lights. Over 140 NYC landmarks are created entirely from botanical “ingredients” such as, orange slices, cinnamon sticks, poppy pods, pine cones, berries, mushrooms, twigs and dozens of other plant parts. The 2009 Holiday Train Show is definitely one of those “not-to-be-missed” and “only in NYC” unique and memory-creating things to do for couples, families and children. Don’t let the size of this photo fool you. Bronx, accessible by Subway and Metro North. Tickets on sale now: Adults $20, Seniors/Students $18, Children 2-12 $8. Note: Attractions Passes do NOT include admission to the Enid A. Haupt Conservatory, the Train Show location. Photo by Michelle A. DeBerryNovember 27-December 31, 4pm. This three-hour journey through the city at night begins at Wall Street and City Hall, and then moves via subway to Herald Square and Midtown Manhattan, where you will move through New York City’s most famous Christmas Lights, including Macy’s, Grand Central Station, Rockefeller Center, and Radio City Music Hall. Finish the tour at a restaurant, and join your guide and fellow travelers for a prix fixe meal.